Why is this book titled Wool? I don’t think there was ever any wool in the story, and I can’t see a connection, unless it’s an obscure reference to pulling the wool over one’s eyes? Regardless, this post apocalyptic novel is enjoyable and exciting, and I really liked it. It was originally published in five parts (ambitiously called novellas, but since they don’t really stand alone, I feel ‘parts’ is more appropriate), and is now available as an awesome omnibus that’s about the size of a regular novel. Each part is well constructed, each unveiling an aspect of a chilling story of human cruelty and survival. I tend to approach all dystopias as who-done-its – I’m always just itching to know how society as we know it ended up where it is in the book. Sometimes this means I end up skipping bits of a book because I just have to know. With Wool, I read every word of Part 1, becoming embroiled in the Sheriff’s struggles and intrigued by the secrets he hinted at, and Part 2, enjoying the bittersweet interactions between the Deputy and the Mayor, and world building that occurred, but growing utterly sick of the description of people climbing down, and then up, the 100+ levels in the silo. Part 3 is where the story really begins, introducing Jules and allowing her character, integrity and stubbornness to shine through. Part 4 is where the past comes to light, leading to shock after shock (of the many plot twists, I really only saw two coming). I admit I skipped a few bits of Part 4 – I found the rebellion a little dull and not well thought out, and was in particular surprised at the ease with which the inhabitants of the silo embraced violence, having lived three generations in peace and with no access to anything that could have taught them about guns, bombs or killing. The author’s claim that this is innate in human nature is troubling. Finally, Part 5 closes the story well, bringing to the forefront the book’s underlying theme of sacrifice. 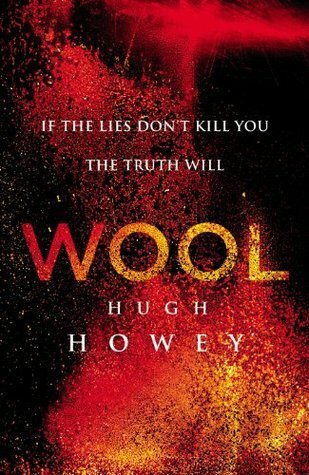 The world-building is admirable, and although the idea explored in Wool isn’t new, I think the way Howey has approached it is. It’s a book that questions the role of every character – we are asked to examine whether Jules is correct in fighting a system that has ensured the survival of so many, and whether those perpetuating the lies are really evil at all. I think the book makes a powerful message about the extent to which humans will go to in order to survive. Of the characters (and there are a lot of them), I found Jules and Solo to be the most compelling, with the others falling more or less into tired stereotypes, but still written well enough to be engaging. Jules in particular, with her curiosity, honest and staunch morals, is an amazing character, and I admire her tenacity and strength of will to carry on where most would have given up. Wool is a book that I thoroughly enjoyed, and that I will happily recommend to others. I am really looking forward to reading Shift, the prequel, and figuring out a bit more about how this world came about. There are still some unanswered questions, some mysteries I hope to get to the bottom of.